Title: The Penderwicks at Point Mouette, by Jeanne Birdsall. 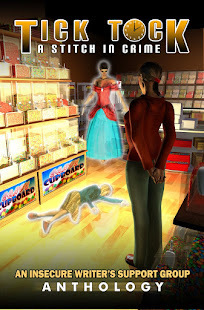 Audio Book read by Susan Denaker. In this third book of the Penderwick family saga, the family is separated when the father goes to England on a honeymoon with the new Mrs. Penderwick and her toddler, Rosalind (the oldest and very responsible sister) goes to New Jersey with her best friend, and the remaining sisters (and Hound) go to Maine with Aunt Claire. Joined by their friend Jeffrey, the Maine contingent has a series of catastrophes and adventures, all reported in Birdsall's inimitable humorous style. I love this series. We read the first book (The Penderwicks: A Summer Tale of Four Sisters, Two Rabbits, and a Very Interesting Boy) several years ago (when our boys were still young enough to read such books to) and I've devoured each book as it came out. So listening to this was a repeat, but listening is always different from reading, too. 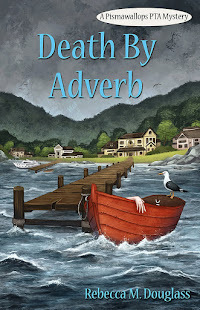 The Penderwick books are well-written, amusing stories that nonetheless have real stakes and fully-realized characters. Even without the marvelous reading by Susan Denaker, I could tell who was speaking almost every time, just from what they said and how they said it. And they act very consistently within their characters. The books are a delight to read, and I think that this one competes with the first for best in series. (The middle book, The Penderwicks on Gardam Street, is somewhat less appealing to me for a variety of reasons, though still a great read). I love the summer-vacation feel of this book and the first book. When the sisters travel, anything can happen (and does). Now, because I've been neck deep in my own writing while listening to this book, I got to thinking last night about structure and plot. Especially I was thinking about stakes. That is, what are the stakes for the main characters, and what makes them something we care about? In this case, the most central character is Skye, who is thrust unwillingly into the role of OAP--Oldest Available Penderwick (adults don't seem to count as far as the sisters are concerned). For her, the stakes are huge: it is her responsibility (as she sees it) to make sure that all of them, especially 5-year-old Batty, return alive and in one piece. Having a good time would be a nice bonus. Birdsall sets the stakes, then ramps up the difficulty with one humorous, yet real, catastrophe after another. And in the end, the stakes climb highest for Jeffrey, in a twist that's not hard to spot coming, but still works well. The smaller crises--injuries, love, and golf balls, not to mention the destruction of the list that tells Skye everything she needs to know about taking care of Batty--kept me fully engaged. But the bigger crisis put an extra twist on the story and gave it a real point. Mission accomplished: high stakes, without horror, life-threatening danger, or even vampires. I'm impressed and inspired. 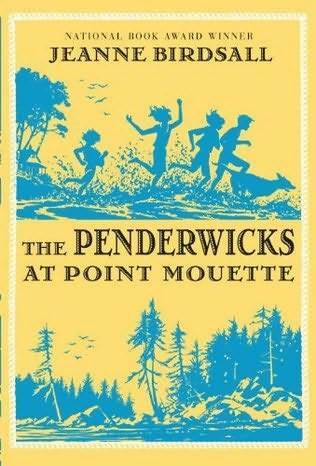 Full disclosure: I borrowed a copy of The Penderwicks at Point Mouette from the (digital) library. I received nothing from the author or publisher for my review, which is my honest opinion. The opinions expressed therein are my own and those of no one else.